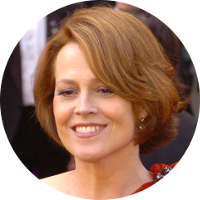 Sigourney Weaver is an award winning actress and film producer. She has been nominated for numerous awards including three Academy Awards. She has won a BAFTA and two Golden Globe awards for either Best Actress or Best Supporting Actress. Sigourney Weaver was born Susan Alexandra Weaver. While growing up, she was no stranger to the entertainment industry as her father, Sylvester Weaver, was a President of the NBC television network and her mother was the British actress known as Elizabeth Inglis. Sigourney Weaver has a number of actors and actresses that she can call kin. These include, but are not limited to, Bing Crosby, Jane Fonda, Christopher Lloyd, Richard Gere, Humphrey Bogart, Vincent Price, Anthony Perkins, Shirley Temple, and Lucille Ball. Isabel Dixon was the paternal grandmother of actress Sigourney Weaver. Sources vary on the given name of Isabel giving either Isabel, Mabel, or Amabel. Her tombstone shows it as Amabel. Sources also disagree on the birth location for Amabel Dixon with census records indicating Louisiana, Ohio, and California as possibilities. Additional sources are needed to resolve the origins and given name of Isabel Dixon, and to identify her parents.